DeKalb County baseball teams flexed their muscles in week No. 5 as seven local squads posted perfect records. 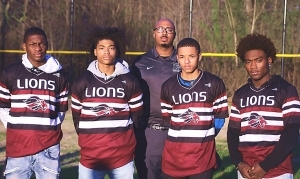 Coach Greg Boatwright’s Martin Luther King Jr. Lions remained one of the most pleasant surprises on the local front in the early going, taking care of Lovejoy (10-6) March 11 and Mundy’s Mill (12-1) March 13 while also going 2-0 to improve to 7-2 overall. Martin Luther King Jr. rode the hot bats of junior Jeremy Cain (3-3; 3 RS; 2 RBI; 2 SB; 1 2B) and junior Jahe Worrell (2-5; 4 RBI; 1 RS) in a 10-6 triumph over Lovejoy March 11. Junior Antoine Lloyd picked up the mound victory, striking out seven and allowing five hits, three walks and three earned runs over five innings. The Lions then erupted for 14 hits in a 12-1 blitzing of Mundy’s Mill March 13, as Cain (4-4; 4 RS; 6 SB), Worrell (2-4; 3 RS; 2 RBI; 2 SB), Lloyd (2-4; 2 RBI; 1 RS), junior Caleb Chisholm (2-3; 2 RBI; 1 2B) and senior Varick Lawrence (2-3; 2 RS; 2 RBI; 2 SB) all contributed multiple hits. Junior Lamont Barner went the full five innings on the pitching end, striking out nine and allowing two walks, three hits and no earned runs. Coach Tyrus Taylor’s Southwest DeKalb Panthers matched that 3-0 showing, storming past Clarkston (19-0) March 12, Clarkston (20-0) March 13 and Miller Grove (13-2) March 16 by the cumulative tally of 52-2 in moving to 6-2 on the year. Senior Eason Bing tossed a no-hitter for Southwest DeKalb in a 19-0 decision over Clarkston March 12, striking out four and walking one over three innings. The Panther offense rode the multiple hit efforts of senior Kendrick Scott (2-3; 3 RS), senior Juston Jordan (2-3; 4 RS; 3 RBI; 2 2B; 2 SB), junior Keun Neal (2-4; 3 RB), senior Chauncey Adams (2-3; 2 RBI) and freshman Sadir Ryan (2-3; 3 RBI; 2 RS). Coach Samuel Marion’s Lithonia Bulldogs rolled past Stone Mountain by a 14-4 margin to inch closer to the .500 mark at 3-4. Lithonia received key offensive outings from senior Jevon Walton (2-3; 2 RS; 1 RBI), senior Jaylen Williams (2-2; 2 RS) and junior Theodore Riddick (2-2; 2 RBI; 2 SB; 1 RS) in a 14-4 decision over Stone Mountain March 12. Junior Jontavius McDaniel earned the pitching victory, striking out three over two and one third innings. Coach Brian Ely’s Chamblee Bulldogs continued to bounce back from a slow start to the season, romping to dominating victories over Miller Grove (19-0) March 11, Miller Grove (17-2) March 13 and Columbia (10-0) March 16 in going 3-0 and moving over the .500 mark for the year at 9-8 overall. Junior Dante Alexander also hurled a no-hitter for Southwest DeKalb in a 20-0 victory over Clarkston March 13, striking out seven over three innings. Coach Eric Hoxie’s Arabia Mountain Rams knocked off Columbia (14-2) March 12 and Columbia (13-3) March 13 in a 2-0 showing for the week to push their overall record to 4-2. Coach Matt Masce’s Tucker Tigers had little trouble rolling past Forest Park (12-6) March 12 and Charles Drew (16-5) March 13 to move to 5-2 on the year. Coach Donnie Hayes and the Lakeside Vikings stayed among the hottest teams in the county, blanking Berkmar to the tune of 11-0 March 13 in improving to 8-2 overall. Senior Kevin Kilpatrick turned in a huge outing at the plate for Redan in a 13-12 loss March 11going 2-4 with five RBI. Senior Tyler Williams tossed a one-hitter over three innings for Redan in a 22-2 victory over Towers March 13, striking out seven and walking only one. Senior Christian Webb (3-4; 3 RBI; 1 RS; 1 HR; 4 SB), junior Brandon Lamback (2-3; 3 RS; 2 RBI; 2 SB; 1 2B) and junior T.C. Rushing (2-2; 2 RS; 2 RBI; 2 SB) produced multiple hits for Redan in a 17-2 decision over Towers March 13. Senior Jordan Whitening struck out six and allowed two earned runs on four walks and no hits to garner the pitching triumph in the contest.